50 states of America in a fun online geography learning game. "USA Puzzle " is a free online knowledge level game to drag and drop the USA states in their correct places. Sort the states of America in USA map online puzzle. Each puzzle piece is a different state, with that state's name, flag and state abbreviation. 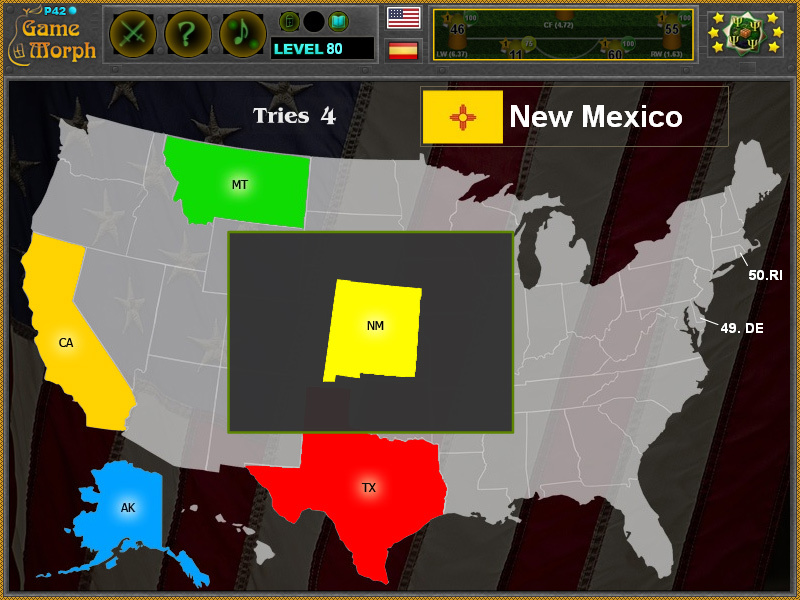 Free online game to explore and study the states and flags on the map of the United States. Geography game, suitable for online lessons and interactive classes. Minute to win it game. Identify all 50 states by size, shape, and location. Info from Wikipedia. USA Flag by https://pixabay.com. States and game code by Ogo Bob. How to play USA Puzzle. You recieve one framed puzzle piece, representing one US state, to place it on the blank US map. Begin to drag the state and the frame will be removed. If dropped in the correct place the state becomes colored and next puzlle piece will appear in the frame. Do this for all 48 arrangeable states. The last two smallest states are visible from the beginning as they are too small to be dragged. Know the states of America and get +1 Knowledge Level. Explore, learn, and study the US with this interactive US map. Extending clear across North America, from the Atlantic Ocean to the Pacific Ocean, the United States is the 3rd largest country in the world. This USA puzzle also includes the non-contiguous states of Alaska and Hawaii, situated at the bootom. The United States borders Mexico on the south and Canada to the north, and the Gulf of Mexico touches states on the south-east. There are 50 states, 1 district and 6 other administrative territories(mostly islands). What are the flags of United States?